Boosts are becoming more and more plentiful these days, and with that, more and more people are looking to pick them up to stay competitive at the top of the contest leaderboard. Because they are limited in nature, and quite expensive in some cases, there is debate over their value vs high scoring Golds. I want to do a bit of a deep dive into the value here, and talk about some of my feelings about the chase for the boosts as a whole. First off, the cost to obtain boosts has been quite different from Purple to Green (or Neon). The purple boosts were not guaranteed per pack, but the odds to obtain any given purple boost was 1:35 packs at 7.5k per pack. That means if you strung out the odds completely, it would cost over 200k to get one. Of course, I rarely had to go that far past 100 to get any of the purples, but that is besides the point. The Neons were 1 per 75k, which as a guarantee is pretty nice. You arent sure who you will end up with, so there is argument that the cost to own is higher than the purples. In my personal opinion, there are two sides to the boost. Gameplay value and collection value. From a gameplay value, playing one above a gold on the purple level is only going to get you 20% more points per play. For a WR or RB, that could be a nice little gift on a long TD, but it is barely negligible for a QB. This is why I dont get why people are so enamored with tracking down any QB card, as the WRs and RBs are always better plays based on the point scoring algorithm. Fantasy wise, maybe not, but at the same time, no contest reward cards are offered for those leaderboards. Now, if you can obtain mulitiple 2.2x or 2.4x boosts, you might be able to get an extra card slot’s points out of them. Playing five 2.2x or three 2.4x boosts in any scoring scenario will equate to one common’s worth of points you would score above playing the same in golds. That is where boosts really make sense, but it can be QUITE expensive to make that happen. Even though from a gameplay perspective, boosts do not score THAT much more than golds, I believe they are worth considerably more than people think. Trading three and getting 9 golds back doesnt make sense in the slightest for me, as it completely negates two things – the stack nature of point scoring and how valuable those extra points are, and the collecting nature of these limited cards. For the foreseeable future, Golds are unlimited in print. They are rarer than any other base card, but they are quite attainable if you want to trade for specific ones. Considering that people are clueless as to the real value of a WR and RB most times, you can trade a Gold QB and get 3-4 back in positions that will score much better for you. There is no reason to give up a set limited card for a card whose count will continue to increase over the entire season. 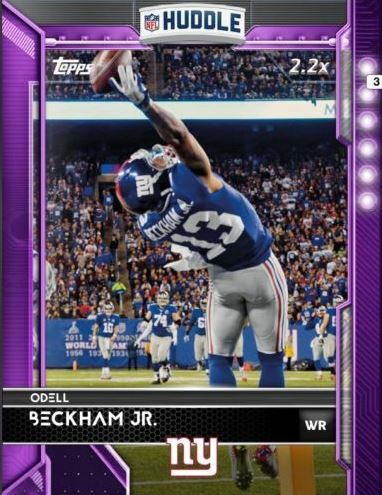 Its fun to trade a card that is easily replaceable to someone for one that really isnt, and as a team collector, I know there are users on the hunt for their team’s boosts every day. That means the collection value of these cards will only increase as time moves on, even if higher scoring boosts become available. If the guaranteed pack format also continues, card counts for the releases will not be as limited as some of the early purples. Those 24 count Petersons, 31 count Julios and other similar may not be the top scoring cards for their player, but they will be the lowest count. I dont like chasing defense in Huddle. The Red Zone Channel only follows the offensive plays, and many defenders scoring a tackle will be outdone on all offensive plays that gain more than 5 yards. It takes a level of detail to succeed with defense that I just dont want to invest, and I see why they are the lowest valued boosts of the bunch. The community just doesnt care enough about points on defense for a boost to be valuable. This include ones for linebackers who actually score quite a few points on tackles. Some of the bigger name guys still have collection value, but just not enough to overcome the stigma of the position they play. Oddly enough, the same thing happens in physical cards too. If you find a team collector who will give up any offensive boost for the defense you have, take what you can get, unless you are someone who can invest the time to make the card count for your strategy. Last year, there were 500 boosts per player and they didnt go away until they were sold out. This year, the boosts will be significantly below that, save a few, and it makes it more likely that A) you can survive without them and B) wont devalue as much with higher levels released. I would be shocked if 2.6x boosts dont come soon, with 3.0x eventually being the top level before the playoffs. You can tell there is a much higher urgency around the release, putting 60 Neons on the market at the same time. This should act as a marker for the fact that higher cards are coming, although they will likely cost more to own. Because of higher costs, lower print runs, and potential changes to the packout structure, your old cards wont be nerfed the way they were in previous years. There will be some loss off the top because the novelty will shift to the newest color, but it wont be a complete drop off like we saw during the level increases over the 2014 season. There are also no set rewards currently available for collecting 5 boosts at a time, which made higher level cards last year seem completely off the wall. Aaron Rodgers was offered as a reward for the last 20 purples, but we havent seen that yet with the neons. I think this should help hold value in the ones people do eventually keep. All in all, people keep trying to find threads between last year’s boost mania and this year’s structure. I see very little in common, other than the fact that boosts are a part of the game. There is more organization, more clarity around availability, and higher costs to own. This means that the game can still be won without spending hundreds on boost packs. Eventually this could change, but there is zero reason to freak out.